NICKNAMED FOR the bluegrass that covers much of this U.S. state, and known for its whiskey and for the Kentucky Derby that takes place annually at Churchill Downs in Louisville, the Commonwealth of Kentucky was named for the Kentucky River, which was thought to have been named from the Iroquoian word(s) for either “meadowland” or “land of tomorrow.” Kentucky is bounded on the north by the states of ILLINOIS, INDIANA, and OHIO, on the south by TENNESSEE, on the east by VIRGINIA and WEST VIRGINIA, and on the west by MISSOURI. The Ohio River runs along the entire northern boundary of Kentucky, and the MISSISSIPPI RIVER runs along the western boundary. 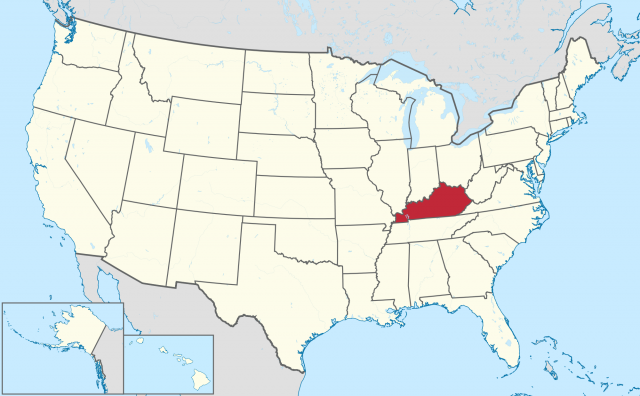 The total area of Kentucky is 39,728 square mi (102,895 square km). The state ranks 36th in size and 25th in population among the 50 states. Kentucky’s largest cities are Lexington, Louisville, Owensboro, Bowling Green, Covington, Hopkinsville, Frankfurt (the capital), Henderson, Richmond, and Jefferstown. Approximately 679 square mi (1,758 square km) of Kentucky are covered by water. In addition to the Kentucky, Mississippi, and Ohio, Kentucky’s rivers include the Cumberland and the Green. Most of Kentucky’s lakes were created by damming river waters, including Barkley Lake, Rough River Lake, Green River Lake, Dewey Lake, and Cumberland Lake. Kentucky has a number of significant waterfalls. The average elevation of Kentucky is 750 ft (228 m) above sea level. The highest point in the state is 4,139 ft (1,261 m) above sea level at Black Mountain, and the lowest point is 261 ft (79 m) above sea level at the Mississippi River. The state is approximately 380 mi (611 km) from east to west and approximately 140 mi (225 km) from north to south. Kentucky’s climate is temperate with annual temperatures ranging from 52 degrees F (11 degrees C) in the northeastern part of the state to 58 degrees F (14 degrees C) in the southwestern section. Temperatures throughout the year range from below freezing in the winter to warm and humid in the summer. Annual precipitation is approximately 45 in (114 cm). Winter snow averages range from 40 in (101 cm) in Kentucky’s highest elevations to 25 in (63 cm) in the northeast, to 10 in (25 cm) in the southwest. Kentucky is frequently beset by storms, particularly from March to September. The geographic area of Kentucky is varied, encompassing five distinct physiological regions: the Bluegrass Region, the Cumberland Plateau, the Western Coal Field, the Pennyroyal Region, and the Jackson Purchase Region. The north central section of Kentucky falls within the Bluegrass Region, sometimes called the Lexington Plain, which extends into the neighboring state of Ohio. Much of the Bluegrass Region is filled with rolling meadows and low, steep sandstone hills known as knobs, which are found in the Knobs Region that forms the eastern, southern, and western sections of the Bluegrass Region. The Knobs Region separates the Bluegrass Region from the Cumberland or Mississippian Plateau. The Cumberland Plateau is part of the Appalachian Plateau, which extends along much of the eastern part of the UNITED STATES from NEW YORK to ALABAMA. In Kentucky, the area is characterized by mountains, plateaus, and valleys that are underlain with sandstone, shale, and limestone. Kentucky’s Cumberland, Pine, and Black mountain ranges are located in the Cumberland Plateau. The section of the plateau known as the Eastern Coal Fields is a mountainous area covered with forests and streams. These mountain ridges are frequently crossed by gaps such as the wellknown Cumberland Gap. Much of the Daniel Boone national Forest lies at the western end of the Eastern Coal Fields. The northwestern section of Kentucky contains the Western Coal Field, which is a hilly area that lies within the Illinois Basin, extending to the Ohio River on the north and to the Pennyroyal Region on the east, west, and south. The Western Coal Field is named for the large deposits of coal that appear throughout the area. The soil on the borders of the Ohio River is highly fertile. The Pennyroyal Region, sometimes referred to as the Pennyrile Region for the small herb that grows in the area or, alternately, as the Highland Rim, covers a stretch of land between the southern border of Kentucky in the Appalachian Plateau to Kentucky Lake. The southern section of the Pennyroyal Region is made up of flat lands interspersed with occasional rolling hills, while the northern section is comprised mostly of rocky ridges containing numerous underground caves and tunnels. The best known of the caves is Mammoth Cave. A treeless area within the center of the Pennyroyal Region is known as The Barrens. The Jackson Purchase Region is located at Kentucky’s western tip and is part of the Gulf Plains Region, which extends from the Gulf of Mexico to Illinois. The Jackson Purchase Region stretches to the Kentucky Lake in the east, to Illinois in the north, and to the Mississippi River in the west. Low hills and flooded plains make up the land in the Jackson Purchase Region. The Madrid Fault is located in this area. When earthquakes hit the area in 1811 and 1812, the Mississippi River began to flow backward, creating Reelfoot Lake. Approximately 40 percent of Kentucky is forested. The coffee tree is the state tree. Kentucky hardwoods include oak, beech, hickory, maple, and walnut. Softwoods include cypress, hemlock, cedar, and pine. Flowering shrubs include buckeye, dogwood, laurel, azalea, rhododendron, redbud, blueberry, pennyroyal, and goldenrod (the state flower). Earlier in Kentucky’s history, bison and elk roamed the forest, but now the woods are filled with fox, groundhog, muskrat, opossum, rabbit, raccoon, squirrel, and deer. In addition to the cardinal, which is the state bird, Kentucky is home to the eagle, egret, mockingbird, yellow-billed sapsucker, crow, kingfisher, and woodpecker. Migratory birds are also frequently seen in the area. Kentucky has four state forests and 59 state parks. Agriculture dominated Kentucky’s economy until the middle of the 20th century when services and manufacturing gained prevalence. Tobacco, hay, corn, soybeans, wheat, fruit, dairy, and livestock are the major products produced by Kentucky farmers. Industries include motor vehicles (the state’s largest industry), health services, furniture, aluminum ware, brooms, apparel, lumber products, machinery, textiles, and iron and steel products. Kentucky’s most important mineral resources are bituminous coal, petroleum, natural gas, stone, sand and gravel, clay, fluorspar, gemstone, limestone, lead, zinc, and fluorite. Kentucky’s coal mines provide 85 percent of the state’s mineral income.